From new construction to retrofit, IFS builds dependable and efficient plumbing system for commercial facilities. Whether you choose bid-build or design-build project delivery, we provide exceptional plumbing and piping workmanship at a competitive price. Our Design-Build approach fast tracks the process, with guaranteed pricing and system performance. To extend the useful life of our clients’ plumbing and piping systems, we offer IFS Quality of Care Planned Maintenance Programs. We tailor a fixed-fee program to meet your budget and needs, and provide preferred scheduling for service and emergency repairs. With or without a planned maintenance program, our fully licensed plumbing technicians are available 24/7 when you need service in an emergency. 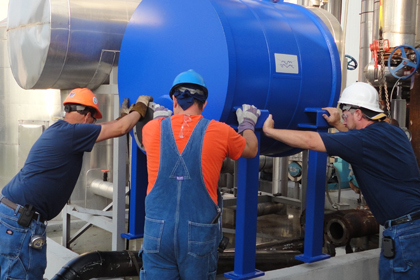 Service is a major component of everything we do at Integrated Facility Services. 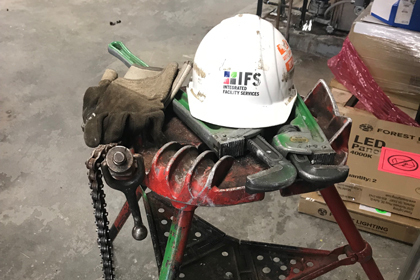 With one call, you can access the IFS service team for all your mechanical systems, from HVAC to plumbing, fire protection and building automation systems. We have one of the largest and most experienced service fleets in the region, with more than 100 vehicles. We’re available 24/7, because service emergencies don’t happen only during business hours. Our Quality of Care Planned Maintenance Program keeps your system running in a reliable, efficient and economical manner. For a fixed annual fee, we provide inspections, testing and analysis, and maintenance as recommended by the manufacture, with preferred scheduling for service and repairs. Your satisfaction is guaranteed! They work very well with the building’s engineers and management, which is very important. They manage the labor on a project and don’t add extra manpower where it’s not needed. We just finished a large project where they did the building automation work, then the fitters did the piping and chiller work. Their departments work together on projects.